Oh Shirley, this is just too cute, he does have that little smile that says "I'm da man!!" Congratulations on being our guest designer this week, you really took it up a notch! Awesome card! LOL, Shirley! I guess he is happy to get the lone candy cane! Love the background and the bear! Great job of "sloshing"! Thanks for joining our team this week! 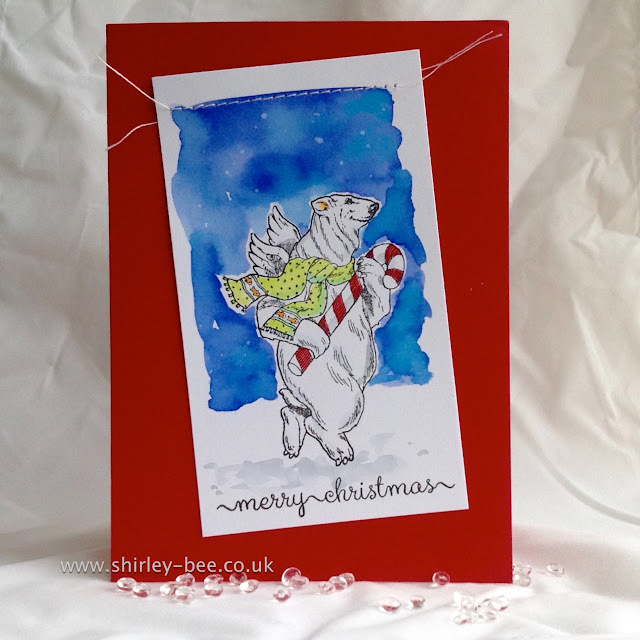 Awesome card Shirley, I thought your bear was dancing on tip toes, so fun. Welcome and Congratulations on being our Guest Designer this week. So pretty! LOVE that bear!! So who knew a Polar Bear could dance on his tip-toes? I LOve this little scene! darling from top to toe! This is soooooo cute! He definitely looks happy to have snagged himself a yummy candy cane! If fact, it looks like he is tip-toeing away, lest he gets caught with the goods! So very cute Shirley. Congratulations on being our Guest Designer this week at Merry Monday. It was so nice to have you Guest Design with us this week at Merry Monday, Shirley! Awesome card - love that bear and your background is awesome! Cheers! I am loving your twinkle toes polar bear, that is just too fun. So glad you could join us as Guest Designer this week. 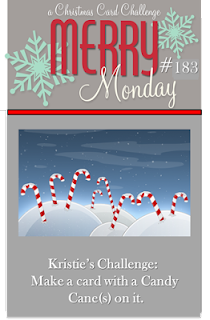 Oh, for gosh sakes...he's a polar bear angel, wearing a scarf, carrying a gi-nourmous candy cane and tippy-toeing! And his face...eeeee! How can I not be completely smitten with him! Adorable!